The corrosion of ferrous water mains is a significant problem for the Australian Water Industry. A significant proportion of Australia’s ageing water infrastructure is composed of cast iron and steel cement lined pipes, which are prone to corrosion on the external surfaces that are in contact with soil. Internal corrosion is not a significant issue for cement-lined pipes. For the water industry to manage these ageing assets effectively, quantitative predictions of the damage likely to result from long-term corrosion are highly desirable. Many of the fundamental corrosion mechanisms are known and there is considerable practical experience on the corrosion of buried iron. However, the prediction of the long-term corrosion losses, of pit depths and pitting extent are not well developed, including understanding and prediction of the quantitative influences of external soil conditions. In this paper the basic mechanisms involved in the corrosion of ferrous metals in contact with soil are reviewed and the likely effects of various influencing factors such as soil moisture content, soil type and soil water chemistry on long-term corrosion are described. The review has found that long-term corrosion is controlled by diffusion processes and is a function of soil moisture content, soil density, and soil water quality. 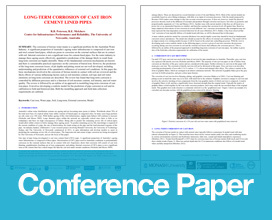 The review is followed by an outline of an approach to modelling long-term corrosion of cast iron pipes. It involves developing a realistic model for the prediction of pipe corrosion in soil and its calibration to field and historical data. Both the modelling approach and field data collection requirements are outlined.